Looking for hotels near Al Maha Wildlife Reserve? Al Maha, A Luxury Collection Desert Resort And Spa is located just a 45-minute drive from the busy city of Dubai. With direct indoor access to both Dubai Mall, Fashion Avenue and the Metro Station, Address Boulevard is the ideal place to stay for anyone coming to Dubai for leisure, business or shopping purposes. The room and the club lounge is so amazing and the staff there are so wonderful especially Mrs. Featuring panoramic views of Burj Khalifa, the luxurious Indian themed Taj Dubai is located in the heart of the business bay area just a stone’s throw away from the Dubai’s famed Downtown area and... we loved that the staff were so nice and helpful. Envisioned by fashion icon Giorgio Armani, this hotel has a private entrance and occupies 11 floors of Dubai’s iconic skyscraper, Burj Khalifa. Stayed in a fountain view suite with the highest floor. Set in a traditional palatial residence, Palace Downtown overlooks Dubai Fountain and the lake surrounding Burj Khalifa. It features an Arabian-style spa and a gym with personal trainer. The staff were friendly. Location is convenient. Room is modern, spacious, clean and well furnished. 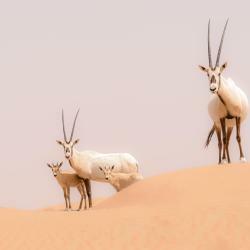 Hotels with great access to Al Maha Wildlife Reserve!